Cranberries, nuts and white chocolate. An excellent combination. It’s quickly coming up on Thanksgiving weekend in Canada. Depending on your particular family, there will most likely be a turkey in your oven either Sunday or Monday. We do it on Sunday. 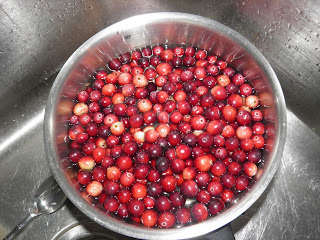 One of the activities I love to do the day before is to go cranberry picking. Cranberry sauce is a fixture alongside turkey for almost everyone. It’s usually the only time of the year we eat cranberries. It’s a pity that we don’t branch out and use them in more ways. Someone in our family is bound to bring homemade cranberry sauce or—shudder—a can of it, so there will be no need of me making any. So I thought it was time to try something different. This is most certainly different. This crustless pie takes only minutes to put together, too. 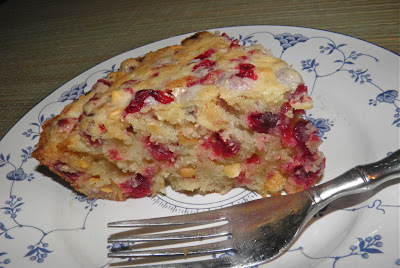 I would call this recipe a cross between a quick bread and a pie. Whatever it is, it’s delicious. A little bit tart and a whole lot tasty. 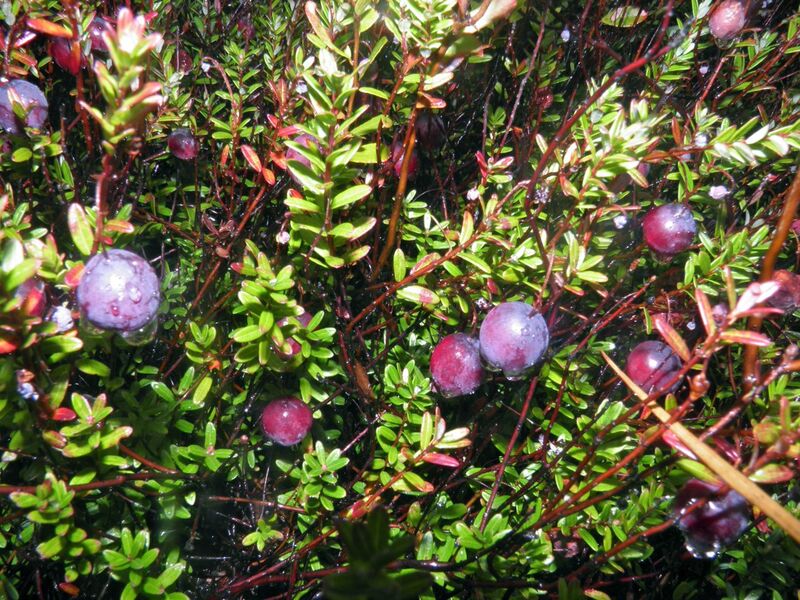 Cranberries—we have two types here (large leaf and small leaf)—are very good for you. They are packed with fibre and Vitamin C. They have also been proven to have many other health benefits. Cranberries help maintain bones and teeth by aiding the body’s production of collagen. They also help in the body’s synthesis of a neurotransmitter called norepinephrine, which is required for healthy brain function. and stems will sink and the berries will float. Add to that list their strong antioxidant properties. Antioxidants hep fight free radicals in the body that are partly responsible for cancers and the ageing process. There are more benefits as well. Look up “health benefits of cranberry” in a google search. You'll find a lot of information. Cranberries are not hard to locate in the wildr. They grow all over Nova Scotia. You’re almost certain to come across them in any boggy wooded area, or along lake shores that flood in winter and are exposed in summer. I highly recommend the activity of picking cranberries if you have small children. It is a memory they will cherish when they are grown. It also will introduce them to the fact that not all food has to come from the supermarket. I pick cranberries every year. The equivalent of a store-purchased bag of cranberries takes maybe 20 minutes to pick – if you’re alone. It also gets you outside and is fun to do. The cranberries this year were a bit on the small side. We had a very dry summer. I was watching them progress since the plants were in bloom this past summer. I foraged my berries alongside the lake where I grew up. Our dog, Henry, and I had a lovely time. He played; I picked. There are two things to keep in mind if foraging. First, cranberries need at least one frost to fully develop the natural sugars in the fruit; otherwise they are overly sour. Second (as always) harvest only in areas that you know are unpolluted. 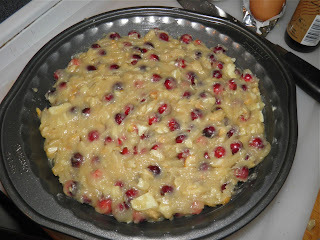 So think about foraging for cranberries with the little ones this weekend. Give them warm memories that will endure for as long as they live. Preheat oven to 350°F. Butter a 9” pie plate. Mix the flour, sugar and salt together. Melt the butter over low heat just until liquified. Wash the cranberries in water. All the leaves and other dirt will sink to the bottom of the pot. Add the cranberries, cashews and chocolate to the flour and toss well to coat. 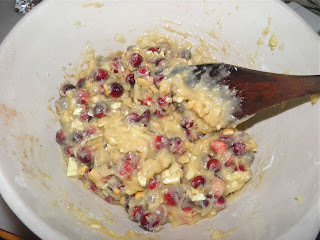 Beat the eggs; then stir the butter, eggs, and vanilla into the cranberry/flour mixture. Spoon the batter into the prepared plate and level off, taking care to get the batter out to the edges as best as you can. Let cool slightly, but serve while still warm if you can. It is excellent when cold as well. Bah! Tis heresy to add white chocolate! Heresy I say! This sounds like something they'd serve at Starbucks!